England faced a severe Fascist threat in 1940 just like it does today. At that time the threat was from Germany instead of Russia. ‘Transcription’ is a novel about spying on fifth column British Fascists who were secretly trying to help Hitler and Germany during World War II. So much depends on an intelligent personable voice to carry a novel. Juliet Armstrong is that vivacious voice in ‘Transcription’. She was only eighteen when she started with the British spy organization M15 as a typist and soon she is recruited for a special mission transcribing conversations taking place in an adjacent bugged hotel room between M15 agent Godfrey Toby and assorted British Fascists. Later she becomes even more heavily involved in the dangerous spy work. Most of the first half of ‘Transcription’ is taken up with Juliet Armstrong’s work with these operations for M15 and the various people she works with and also some of the British Fascists. I found this part of the novel entirely fascinating and high energy. We get a captivating picture and insight into the various individuals who make up this operation as well as those who are being spied on. Certainly the equipment used to bug the hotel room was primitive by today’s standards, but that’s part of the fun. In her M15 work Juliet ultimately gets involved in some dangerous grisly situations. Later we jump forward to 1950, and the war is over. Juliet is now working for the BBC as a radio producer. Somehow the characters and situation at the BBC don’t have quite the impact of those in M15. For one thing Juliet naturally has somewhat of a condescending attitude toward her BBC work which is of course nowhere near as exciting as her time at M15. Later her M15 connection comes back to haunt her even during peacetime. ‘Transcription’ is a compelling read, perhaps not quite at the level of Atkinson’s amazing ‘Life After Life’ or ‘Behind the Scenes at the Museum’, but still gripping and engaging. Intelligent fun. That is why I read Cervantes. That’s why I read Chekhov. That’s why I read Shakespeare. That’s why I read Kate Atkinson. Nooo, I’m not going to buy it until I’ve read the other two KA books I have on the shelf!! I’ve never read Kate Atkinson but I’d like to. Excellent quote by Romain Gary. I’ll probably be using it soon! 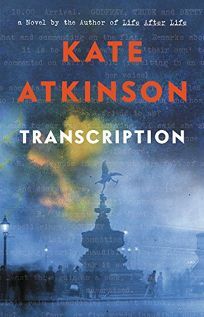 Well, I’ve never read Kate Atkinson either – but your enthusiasm almost convinces me I should…. I too sometimes wish the 21st century had never happened, especially in pop music. Our reading strategies are different. I have read nearly all the classics, but am not much interested in early lesser figures. For modern literature I try to figure out who might possibly become a classic by reading reviews. I get burnt occasionally especially on the new stuff. Different approaches. Vive la difference.